Bonex Scooter used in all diving disciplines. Have a new look at your familiar environment. You have a much greater radius of action without strenuous paddling. You can visit several diving spots in one dive. You can dive to large and deep wrecks easily even in stronger currents. The Ecos is easy to handle even on very small boats. Handling, range and reliability are what count in cave diving. Only the Bonex underwater Scooter unites several safety features. It has an emergency drive switch which considerably minimises the risk of failure and brings the diver back to the cave entrance even under the most difficult conditions. 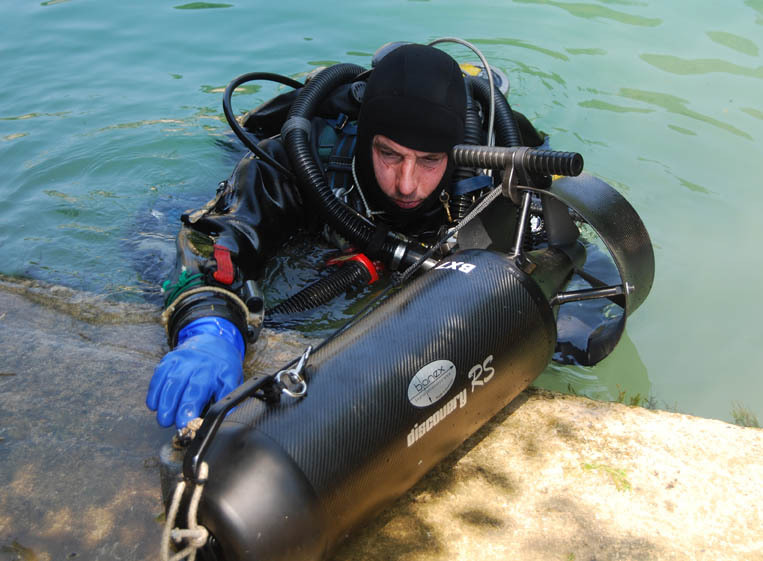 The Bonex Scooter allows a diving depth of 200 m as standard. Extensive pressure chamber tests of the individual Bonex Scooters guarantee their safe use at extreme depths. The searching of large areas and covering of great distances demands long runtimes. The Reference or Discovery in connection with a navigation unit is the optimum choice here.